Elizabeth Oommen, D.O., has joined St. Peter’s Diabetes and Endocrine Care. Board-certified in internal medicine, Dr. Oommen practices specialty care in endocrinology. Her professional interests include the management of thyroid cancer and thyroid nodules, including the fine needle aspirations of thyroid nodules. She is also interested in calcium disorders, as well as the use of pump and sensor technology in the management of diabetes. 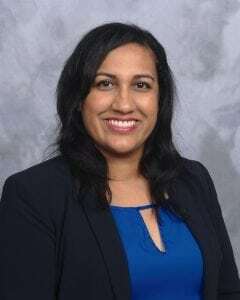 Dr. Oommen received her medical degree from Nova Southeastern University of Osteopathic Medicine in Florida. She completed a residency in internal medicine at Plaza Medical Center in Fort Worth, Texas, and a fellowship in endocrinology at Stony Brook University Hospital in Stony Brook, New York. She received her bachelor’s degree from the University of California, Los Angeles. St. Peter’s Diabetes and Endocrine Care is welcoming new patients at its office at 63 Shaker Road, Suite 201, Albany. Click HERE for more information, or call 518-471-3636.